At a young age, you’re probably more concerned with how your car looks and its performance than its safety. But all of that changes as soon as you have a family (or at least it probably should). After the first child arrives, car buying becomes more about which vehicles offer the most space and provide the best protection. There are several factors to be aware of when choosing the new family car. Cargo Space – This depends on how old your child is, how much traveling you will be doing, and whether you will be pulling carpool duty at any point. There’s a reason that minivans have become known as “soccer mom vans.” For traveling in the suburbs or the city with only one or two children, a normal five sedan should do just fine. Once you have three or more kids, consider upgrading to a seven-seater. Having that extra space to keep kids separated on long trips may turn out to be a life saver later on, and you’d be amazed at how much luggage a family of five requires. Gas Mileage – Once again, this depends on how you use the car. For simple commuting with a small family, a car with efficient city mileage may be best; conversely, a larger car with good highway mileage may be better for large families who take trips on a regular basis. Safety Ratings – All cars considered for your new family car should have high crash test ratings and be of an adequate size to offer protection in the event of a crash with a larger car. Airbags are a necessity and side airbags are highly recommended. Luckily, the majority of new vehicles come standard with front, side and curtain airbags. Cars with child-lock capabilities should be considered if your child is particularly adventurous and inquisitive. Mazda 3 or Mazda 6: Mazdas ranked well in multiple lists for their spacious size and dependability. Ford Explorer: Not so great in the 90's, but great now for families who may need more space but are not quite ready for the minivan. Honda Odyssey: A smart minivan pick, the Odyssey provides both space and fuel economy. Hyundai Santa Fe: A crossover, perfect for larger families who don’t need the full size of a Minivan or SUV. 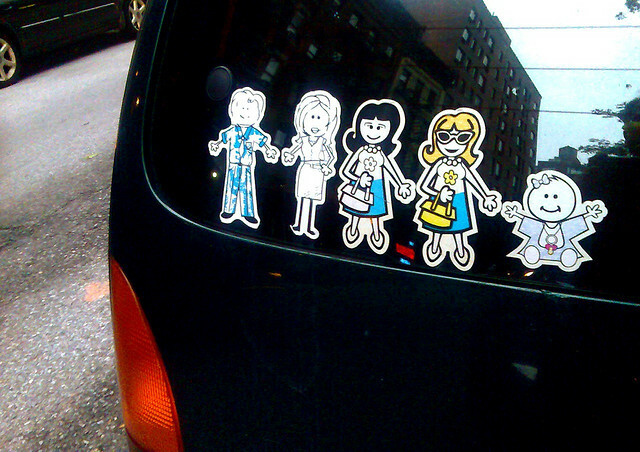 What "big family" vehicle do you own to haul your family around in? My sister has 3 kids and loves her Mazda 3 – it’s perfect for school runs and taking the whole family out (with extras if needed)! Carfax have some great used Minivans at the moment, worth having a look if you are interested in buying a minivan but are a little worried about the cost of a new one.